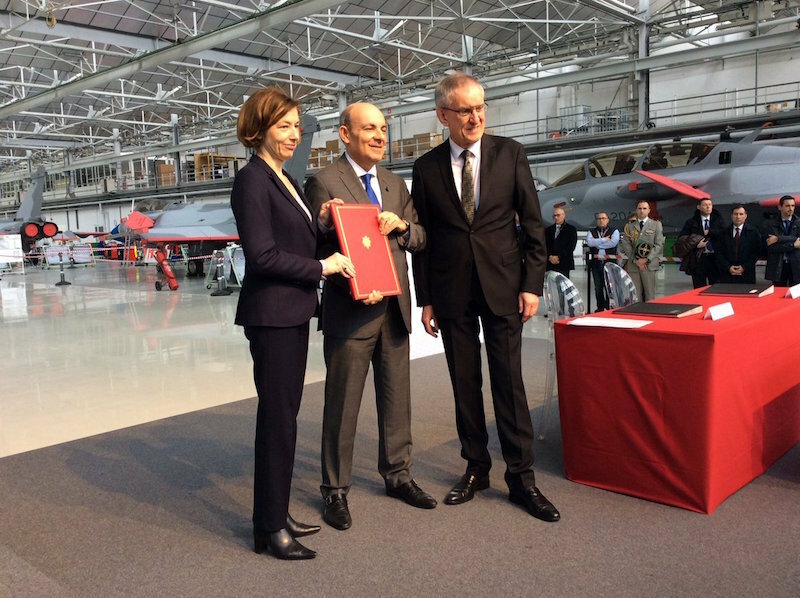 (L to R) French Minister of the Armed Forces, Florence Parly; Dassault Aviation Chairman and Chief Executive Eric Trappier and Chief Executive of the French DGA, Joël Barre, pose with the Rafale F4 development contract (Dassault Aviation photo). 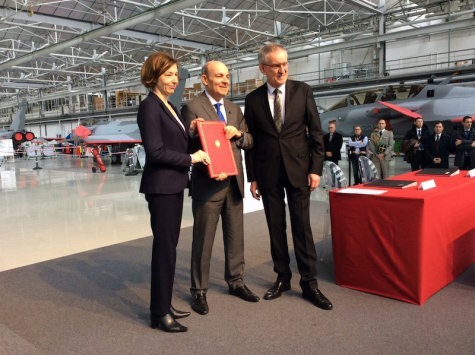 On January 14, 2019, French Minister of the Armed Forces, Florence Parly, announced the award of a contract for the development and integration of the so-called “Rafale F4”: the new Standard for the Rafale omnirole combat aircraft, which will be delivered to the warfighters in 2023 (first step) and in 2025 (last step). The Rafale program is evolving through the development and the implementation of successive “Standards”, each of them bringing improved performances and additional capabilities to the Rafale omnirole combat aircraft, in order to match perfectly the evolution of the operational requirements from the warfighters. The most recent Standard, called “Rafale F3-R”, was officially qualified on October 31, 2018, by the French Defense Procurement Agency (DGA). It contains important software and hardware evolutions and adds three new major and genuinely game-changing capabilities to the Rafale: the full integration of the Beyond Visual Range Air-to-Air Missile (BVRAAM) MBDA “Meteor”; the integration of the new-generation Thales “TALIOS” laser targeting pod; and the full integration of the Safran AASM “HAMMER” air-to-ground modular weapon in its laser terminal guidance version (NATO designation: SBU-54). Collaborative combat is now crucial for taking part in coalition operations, countering new types of threats and conducting sovereignty operations. The Rafale F4 will be a genuine “connected aircraft”, implementing innovative connectivity solutions to optimize its operational effectiveness in networked/collaborative combat, with new satellite and intra-flight data-links, communication server and software-defined radio. Its ability to collect, analyze and share data will constitute a powerful force multiplier that will enhance all airborne, surface and ground-based assets in the battlespace. The sensors of the Rafale will be improved in order to maintain the aircraft’s operational capabilities and survivability against new and future threats. Improvements will mainly concern the RBE2 AESA (Active Electronically-Scanned Array) radar in the air-to-ground mode (noteworthy is the fact that the Rafale is the only European combat aircraft in operational service to incorporate today the cutting-edge “AESA” radar technology), the integrated advanced self-protection and countermeasures system (SPECTRA electronic warfare system) with new threat detection and jamming capabilities, and the multi-spectral Front Sector Optronics (FSO). -- the MLR (Mid-Life Refurbishment) version of the MBDA “SCALP” long-range cruise missile, which will be delivered from 2020 onwards. The Rafale F4 will include a new Prognosis and Diagnostic Aid System introducing predictive maintenance capabilities (the purpose of predictive maintenance is to anticipate failures before they occur). Other maintenance optimization features are scheduled, particularly with solutions based on Big Data and artificial intelligence. Lastly, the aircraft will be equipped with a new control unit for the Safran M88 engine. The Rafale is an extremely effective new-generation, combat proven (Afghanistan, Libya, Mali, Central African Republic, Iraq, and Syria; more than 40,000 flying hours in combat operations have been completed so far by the Rafale fleet) omnirole tactical fighter, but development is continuing apace to exploit more and more of the aircraft’s tremendous capabilities, and to seamlessly add new ones. 1. The Rafale will ultimately replace all the current types of legacy fighter aircraft in the inventory of the French Air Force and the French Navy. 2. To date, 180 production aircraft have been ordered for the French Air Force (in two versions: the single-seater Rafale C and the two-seater Rafale B) and for the French Navy (the single-seater Rafale M). Since 2015, 96 Rafale aircraft have also been ordered for the Egyptian Air Force (24 aircraft), for the Qatar Emiri Air Force (36 aircraft) and for the Indian Air Force (36 aircraft). 3. As of January 21, 2019, 152 production aircraft have been delivered to the French warfighters (46 Rafales M for the Navy; 48 Rafales C and 58 Rafales B for the Air Force) and 23 Rafales have been delivered to the Egyptian Air Force. -- in-flight refuelling (“buddy-buddy” tanker capability).